← It’s A Halloween Weekend! 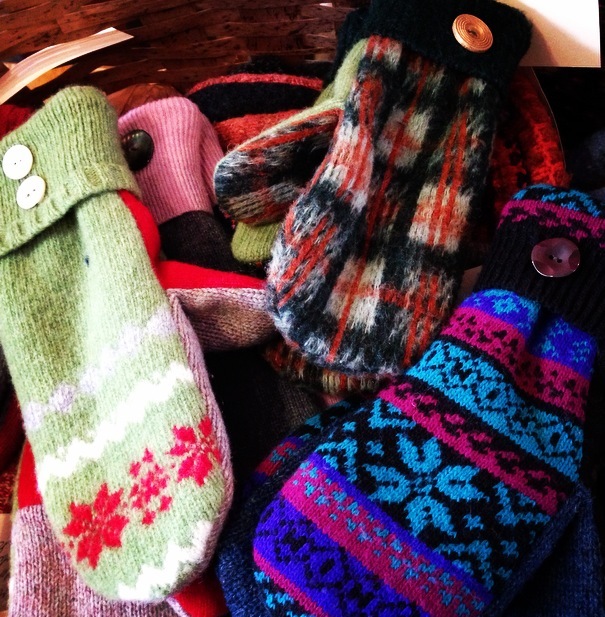 This new event is organized by Carole Spelic’ and Christine Tharnstrom, and kicks off this Sunday, November 1, 2015 at the Green Lantern Studios, 261 High Street, from 10 a.m. – 4 p.m.
Carole and Christine — and anyone willing to volunteer and have fun at this event — will make mittens and headgear for children and adults from wool, fleece, and other materials. The finished products will be donated to those in need through the Free Clinic and SWCAP Program in Dodgeville, and the Mineral Point Elementary School. The Green Lantern Studios will be converted into a winter workshop with 8 sewing machines, plenty of workspace, materials and prototypes of neck warmers, head bands, hats and mittens. Drop in and spend whatever time you have (just a few minutes to a few hours) to make a difference in a life. Kids and adults are welcome! Feel free to bring mitten embellishments, materials, scissors, snacks and anything else you can think of to make the day fun together. This is the first planned Mitten Project. Another one is in the works for Santa Day, December 5, 2015, at Shake Rag Alley. What a great way to have fun and make a tangible difference at the same time. Thank you to Carole and Christine for making this happen. This entry was posted in Upcoming Events and tagged Carole Spelic', Christine Tharnstrom, Green Lantern Studios, Mineral Point WI, The Mitten Project. Bookmark the permalink. I am so sorry I missed this. Will it continue through Nov? Jodie – They are planning to do another one at Shake Rag on December 5th.